Fragrance is incredibly personal. We associate it with a specific time, memory, or person, which is consequently why it evokes actual emotional responses. I know this to be true in my own life. You see, I hate heavy floral fragrances, yet my favorite perfume of all time (so far at least) is the original Chloé Perfume ($25), designed by Karl Lagerfeld in 1975. It smells like jasmine, honeysuckle, tuberose, and amber (you can't get much more floral, or heavier, than that). Although I didn't question it for years, I've now come to realize that I call it my favorite because it's the very same perfume my mom wore throughout my entire childhood. So now when I wear it, as a 20-something, I'm reminded of her and home and stealing stealthy spritzes from her vanity when she wasn't looking. This resulted in a minor fragrance epiphany. I realized I knew next to nothing about the other scents lining my vanity and much less about perfume in general. Sure, I can list the main notes in each bottle, but beyond that, things get murky. It was at this point, standing in front of my mirror, that I realized that I couldn't even describe the difference between fragrance's two main categories: eau de parfum and eau de toilette. (I know what you're thinking. That's blasphemous for a beauty writer to admit. As it turns out, the distinction between eau de parfum formulas and their eau de toilette counterparts is clear and simple. 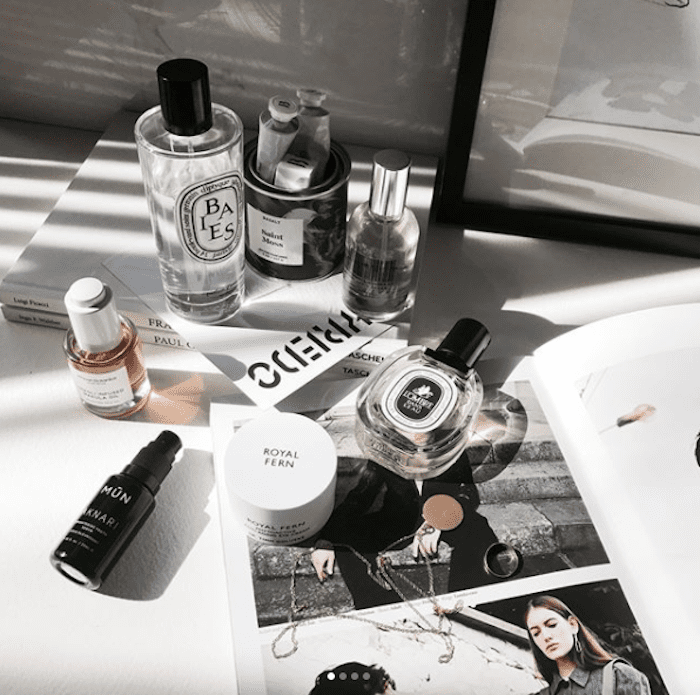 According to Mary Wallace, who is the marketing manager for Diptyque (the impossibly chic French perfumery we all know and love and hoard), it all comes down to fragrance concentration. "Generally, an eau de toilette concentration is between 8% and 12%, while an eau de parfum concentration is between 12% and 18%, although the concentrations of EDT versus EDP can vary," she explains. One thing is for sure: No matter if the specific numbers vary by product or brand, an eau de parfum will always be more concentrated than an eau de toilette. What's interesting is how the scent "experience" changes between an eau de parfum and an eau de toilette. "As the juice is present in a higher concentration, the sillage—or lasting power of the scent—will often change, and this increased wear will change how the fragrance develops on the skin throughout the day," Wallace explains. In other words, an eau de parfum has a higher concentration of fragrance, which results in a longer-lasting and more aromatic application. What's more is that the eau de parfum and eau de toilette might not smell the exact same, even if they're labeled as being the same fragrance. For Diptyque fragrances, at least, the actual formula is tweaked to accommodate the different concentration of fragrance. "For Diptyque, the eau de parfum is not simply a more concentrated version of the eau de toilette—the eau de parfum is a new interpretation of the original composition. For example, in the Do Son eau de toilette, you have tuberose, jasmine, and orange blossom in harmony, while in the eau de parfum, you have a true overdose of tuberose. This note is amplified, which brings a totally different dimension to the experience of the scent." Wallace says that's why eau de parfums and eau de toilettes aren't exactly interchangeable. "Often, the eau de toilette is both lighter and fresher, while the eau de parfum is richer and more lasting. For daytime or office wear, the eau de toilette may be more comfortable and appropriate, while the eau de parfum offers more depth, which can be nice for the evening." You might also want to consider the temperature and time of year before choosing one over the other. "In humid and hot climates, a crisp eau de toilette may be preferable, while in cooler weather, an eau de parfum may offer more warmth and depth." If you didn't believe it before, this should have convinced you that fragrance is indeed a fine art and not just an olfactory instinct of "this smells good" and "this doesn't." Before purchasing your next fragrance, test out both the eau de parfum and the eau de toilette versions. Also be sure to pay mind to what time of day, time of year, and setting you'll be wearing the fragrance in. As Diptyque taught me, it all matters. So gone are my days of blindly grabbing one or the other. In winter or on nights out, I'll reach for the floral Do Son Eau de Parfum ($165). In the heat of summer, or when I'm heading to the office, I'll sub that out for the lighter and fresher fig-scented Philosykos Eau de Toilette ($135).